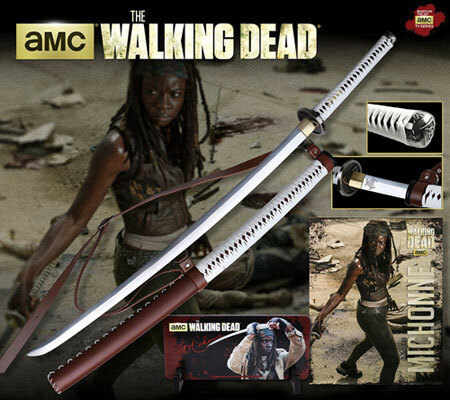 Walking Dead Samurai Swords of Michonne for sale feature an accurate replica of the one used by Michonne in the hit AMC series The Walking Dead. This replica follows traditional katana hand forging technique and is an officially licensed replica. 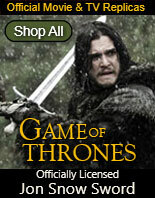 Walking Dead Swords for sale are part of the collection of officially licensed movie and TV items available. These samurai swords are modeled after the one carried by Michonne in the series The Walking Dead. The swords measure 42 ½ inches in all. 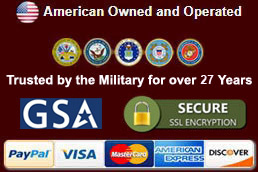 They feature an unsharpened full tang 27 inch 1045 high carbon steel katana style blade. 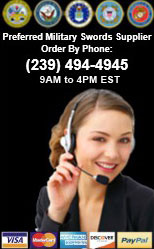 The handle is traditionally wrapped in white leather and authentic black rayskin. The metal fittings were replicated from the studio prop used by Michonne in the series. The wooden scabbard is wrapped in brown leather with a white leather overwrap. These swords have a leather carrying strap. This officially licensed samurai sword is etched with the Walking Dead logos on the blade. 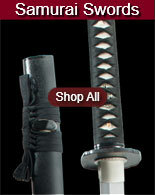 Buy these beautiful Walking Dead Samurai Swords for only $169.99. 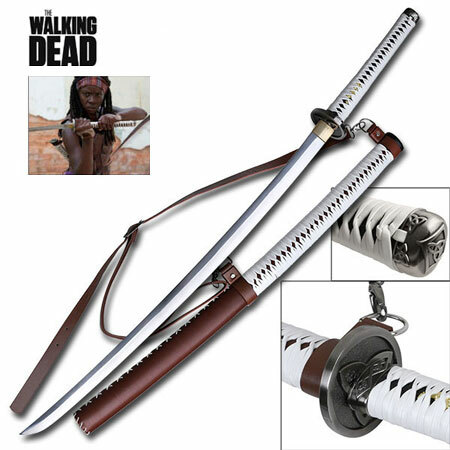 Walking Dead Swords Set for sale features a 40 ½ inch samurai katana. This officially licensed Walking Dead collectible set includes Michonne’s sword, a wall display plaque and a Walking Dead poster. 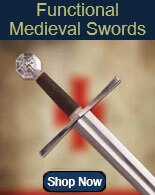 The swords feature a 26 ¾ inch unsharpened 6.75mm thick 1045 high carbon steel blade. Just like the sword Michonne’s wields in the hit AMC series, the handle is wrapped with real white leather and features genuine ray skin. The scabbard is wrapped with real brown and white leather. Buy the officially licensed Walking Dead Collectible Swords Set for $189.99.